The award winning Crowne Plaza Milwaukee - West is a state-of-the-art, full-service hotel that offers you an ideal location with deluxe amenities. Our Wauwatosa hotel is located just 15 minutes from Mitchell International Airport (MKE) 10 minutes west of Milwaukee. The hotel is set within the Milwaukee County Research Park and is within walking distance of GE Healthcare and United HealthCare. Convention facilities are a short drive from our hotel in Metro Milwaukee, including the Wisconsin Expo Center and The Wisconsin Center. Our accommodations are in close proximity to the Medical College of Wisconsin, Children's Hospital of Wisconsin, Froedtert Hospital and other clinics in the Milwaukee Regional Medical Campus. Leisure travelers know that they can shop at the Mayfair Mall and the new Mayfair Collection, or spend the day at Miller Park, home of the Milwaukee Brewers. The Milwaukee Zoo is located just a mile away offers a day of family fun. Our hotel near Milwaukee features over 7,900 sq. 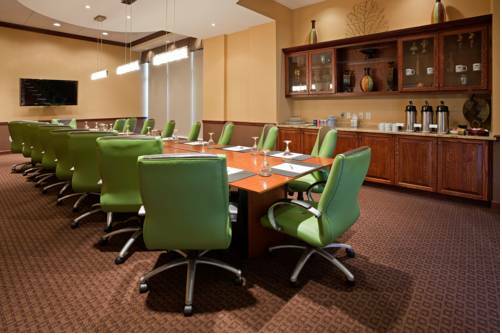 ft. of meeting space, and our outstanding staff can assist you in planning any event. From our Sleep Advantage Program amenities to fine dining at our restaurant, we have the deluxe amenities you deserve when you travel. Traveling for Success matters to the Crowne Plaza Hotel Milwaukee West. Innovation: Guests lodging in Wauwatosa at our Milwaukee hotel enjoy fine dining at our restaurant, Innovation. Gather, dine, and celebrate for an altogether contemporary and classically upscale American cuisine experience. Innovation Lounge: Guests of our hotel can relax and enjoy the perfect glass of wine or choose from our regional selection of brews when they visit our Innovation lounge. This hip oasis offers tasty appetizers or a light meal from a regionally inspired menu.